As summer and festival season draws to a close, it’s nearly time to pack away the tents and wellies for another year, but Electric Fields is ensuring we finish the season with an almighty party! An absolute gem in the summer calendar, with massive plaudits from critics and punters alike, the stellar line-up not only punches well above it’s weight but positively goads the big gun festivals. This year’s festival takes place at Drumlanrig Castle, kicking off this Friday 26th August. 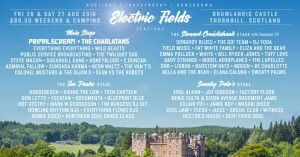 Electric Fields boasts incredible headlining performances from The Charlatans and Primal Scream, with performances from Everything Everything, Admiral Fallow, Neon Waltz, The Twilight Sad and The Sugarhill Gang. Given the amazing line-up throughout the festival, Feast has picked out some incredible must-see acts. Sweaty Palms have been winning rave reviews, with their mix of psychedelic garage rock, and lo-fi scuzzy punk. Young, exciting, and refreshing, they are sure to get the fest off to a rousing start. Bella And The Bear will provide something different with their blend of lush harmonies, ethereal vocals, almost poetic word -smithery and intricate acoustic guitar. Baby Strange are now festival favourites. The Glasgow trio should ensure a lively, melodic grunge, guitar drenched set. Tracks such as ‘Pure Evil’, and ‘VVV’ should make an electrifying set. It’s going to get loud and sweaty! Fat White Family area live band. Expect an intense, ramshackle, teeth-rattling lo-fi rock n roll set, and…. the unexpected! Especially if new single ‘Breaking into Aldi’ is anything to go by! Industrial-synth duo Factory Floor, should be an interesting set as recent shows have seen the duo, explore an expanding electronic analogue set-up which encompasses Chicago house, techno, muscular synths, and guitar. It sounds like Factory Floor will prove to be intense and thrilling. Honeyblood the duo has supported a raft of heavy weight acts in their time, and look at home on any stage. Expect an exciting performance of ballsy, energetic lo-fi surf and rock. Previewing their forthcoming album ‘Babes Never Die’, this is perfect festival viewing! Feast have had the pleasure of seeing White several times this summer. The band are fantastic live, with frontman Leo Condie channelling Jarvis Cocker and Brian Ferry, to synth-tinged live assault. The band are hotly tipped, so why not see what all the fuss is about before they swagger onto the bigger stages calling. Given the abundance of amazing acts and gorgeous setting, we can’t wait to get to Electric Fields, see you there!